Over the years we have built up quite a collection of tools within tools on our Alpha SEO software suites. Each suite was built with one complete strategy in mind to maximize what you can do with each. Video Synd Alpha (which was the first Alpha tool) was designed to get links on Video sharing sites. This gives a more complete approach to a strategy and there is NOTHING that takes more than a few clicks or 10 minutes max set up time for a campaign (often much less time needed). The idea was always to make tools that are easy to understand, fast to set up campaigns and allow you to scale your SEO using automation with as little effort as possible. 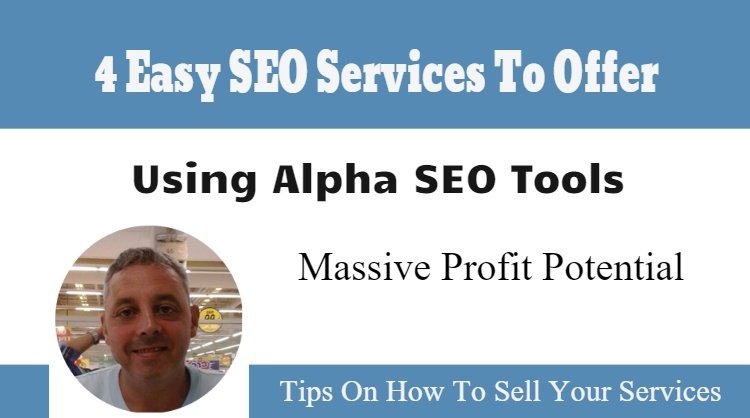 Now this isn't a sales pitch for my Alpha tools, but it it a reminder to existing customers of the power of these tools and to provide some suggestions on how to make money with them. Let’s take a look at some awesome (10 minute) SEO & Traffic generation services that you can offer local businesses, on gig sites, outsource services sites or larger nationwide businesses with massive profit potential! If you follow my step by step tutorials on the RankAttack SEO course you will see me using this strategy to rank within hours for a keyword phrase with 2,400 search volume. Sure I used some second tier backlinks to the YouTube Video which had ONE link in the description to a blog post. The link in the YouTube description will rise in the search results higher than the video. We increase CTR from the search results to the video, and then the software will watch the video for high retention views. We have found that as little as 25 CTR/Views combo can be enough to get first the video ranking and then for some reason the web page will start to overtake it. This is a fast, easy and very sellable service with massive profit potential. Cost: Can Be Low Cost Due To Targeting Accuracy To Place Your Ads On Videos In Your Niche. The YouTube Ad Placement Tool Finds Thousands Of Relevant Videos To Advertise On That You Can Upload To Your Adwords Account As Placement Targets. We used this strategy for a large staffing franchise back when I was doing local SEO services, basically we got the CEO and one of the directors to do a Q&A session covering the most common questions and objections from potential customers who are interested in buying what was then a $135,000 franchise. Today with the ability to do live streaming on these three platforms and the ability to use a pre recorded video the traffic potential is much bigger than it was then. This has really been a very popular service for many local SEO’s and is super simple to use to suppress bad urls. The RankAttack SEO method with a more aggressive use this time of Video Synd Alpha or Live Stream Alpha should be sufficient to drown out any negative web pages. You could also add citations to the video descriptions for an extra boost too, as well as using the web 2 account creation and posting tool with citations and add your location coordinates in the Videos at the same time in the posting settings. That’s just a few ideas for now and i may do a part 2 of this article with more service suggestions. How To Sell Your Local SEO Services? Fiverr Gigs For Classified Ads like this one will cost just $5.00 for 25 ad sites for 30 days, do that one time a month and you have a yearly cost of just $60.00! More similar ads can be found here including for UK, USE, Canada and other countries. It doesn’t matter what country the client is from, this is an online based business that can be done for anyone from anywhere. Add a link to a landing page created by lead genesis to segment your leads! Use This Proven Client Getting System From Leadcaster to get business owners calling you. This step by step system puts your marketing message in front of 200 business owners daily. Follow their step by step system closely for best results, but try to offer specific services and tasks for a set price. This helps avoid being sucked into feeling like an employee which holds your own business back and makes it impossible to scale. It includes 7 MODULES - WP Landing Page Theme, 12000+ Words Lead Magnet, 6 HD Leadgen Videos, 6 logo , 6 business cards, 6 pre-populated flyers and 6 postcards templates. Use the Lead Genesis plugin to split test your landing page with this one and also check out this other SEO done-for-you lead magnets package which is good quality too and you could also add an SEO toolkit to your site to look like a serious player for under 12 bucks as it has 25 SEO tools which can attract repeat visitors but more importantly you can use it for lead generation. With low cost and highly targeted social media marketing and advertising options getting traffic to your services should not be hard.